This thin, delicious Turkish pizza called lahmacun is the ultimate street food in Turkey that we all love. 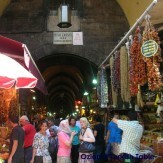 A very popular lunch time snack, lahmacun is sold in street stalls as well as in restaurants at home. In Kebab houses, mini lahmacuns are served as an appetizer that I just can’t get enough. 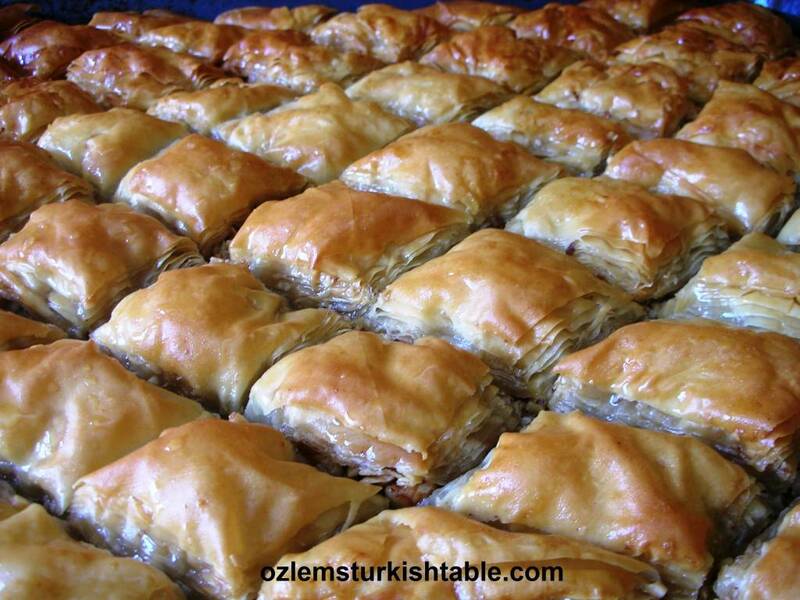 We Turks also love to have it as a take away food, a great, healthy alternative to fast food and the children love them too. Lemon is liberally squeezed over and then it is rolled up with sliced tomatoes, onion and parsley salad, piyaz. Here is my lahmacun recipe; hope you enjoy it as much as we do! First make the dough. Place the sugar and the yeast in a small bowl with half the lukewarm water. Set aside for about 15 minutes until frothy. While the dough gets ready, prepare the topping. Lightly soften the onions in the olive oil. Add the chopped tomatoes and cook until the liquid has been absorbed. Add salt to taste and set aside to cool. Put the ground lamb in a bowl and add the tomato paste, parsley, paprika flakes, lemon juice, cooked onions and tomato. Season with salt and pepper and work this mixture into a paste with your hands. Cover and keep in the refrigerator until you are ready to use. Once the dough doubled in size, punch down the risen dough, knead it on a lightly floured surface and divide into 6 pieces. Roll each piece into a thin flat round, stretching the dough with your hands as you roll. Oil the baking sheets and place the dough rounds on them and spread a thin layer of the meat mixture covering the edges too. Bake in the oven for about 15 minutes, until the meat is nicely cooked. 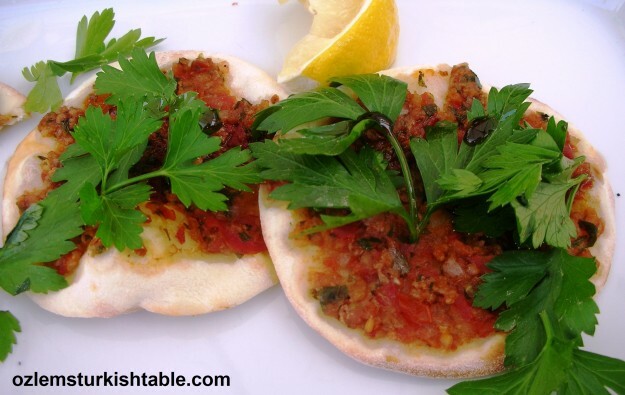 Serve lahmacun hot, with lemon wedges to squeeze over by the side. i have been wanting to make this so thank you for the recipe! 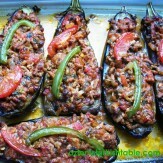 Merhaba, thank you for this recipe. Can I use baking powder instead of yeast and if so how much? 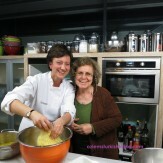 Özlem, Thanks for this recipe. We make Italian style pizza from time to time but really, this is so much lighter and healthier. We’ll definitely try it. I don’t know why I have never made theses as I make pizza all the time. This is much more healthy. 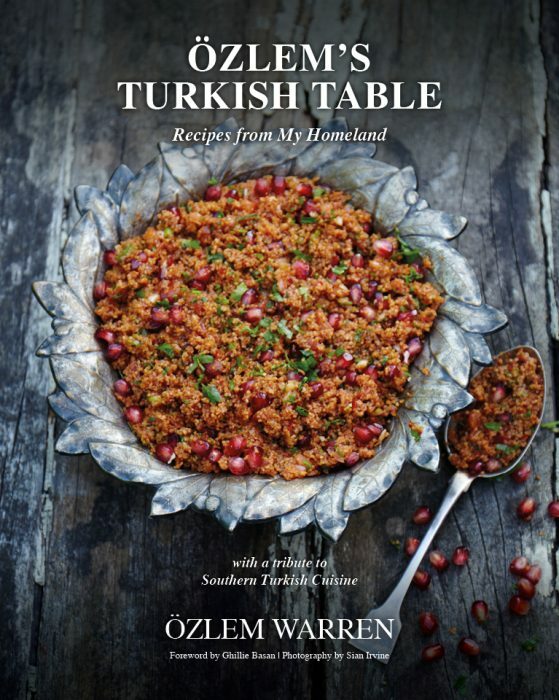 One of my all time favorite recipes, Ozlem! Each bite just melts in the mouth. XxPeri. I have eaten something like this in the past but I’m sure that it didn’t have any lemon. So it can’t have been authentic! Lemon would make a real difference to the taste. This is definitely making me hungry. You are right Phil, a good squeeze of lemon bring the whole thing together nicely, a must for me! Glad you enjoyed the post. Is it OK to use other ground meat such as buffalo? I have a ton in the freezer. Merhaba Cali, I haven’t used myself but why not? I hope you enjoy it, afiyet olsun! Thank you for this recipe! It takes me back to my visit to Cappadocia in 2011, when our driver bought us lahmacun for dinner on-the-go. I make these for family and friends, and they all love it! A little onion salad with sumac perfectly tops it!